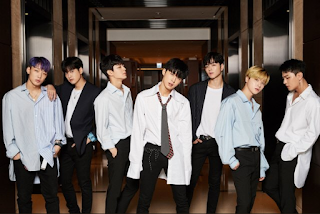 iKON Mini Album New Kids Continue Press Conference | iKON Mention Blackpink - Having a comeback twice in a year isn't a common thing in YG, it's difficult to come out often because if the quality of our music isn't up to far then we're not ready. It seems that through the unexpected success of Love Scenario, we have gotten more attention. Even kids genuinely enjoy the song, and from there I think it was only natural that people are expectant of this new album. B.I said "I became very grateful to see that even the kids sincerely enjoy the song (LOVE SCENARIO), in a sense I felt that maybe a lot of people do enjoy listening to it, so I'm very grateful for the unexpected outcome. I don't look at charts like looking at grades, & I don't think I have a particular grade I want to achieve. Rather than looking at grades and seeing the differences on results, iKON focus more on the process and work to the set-goal. Rather than pressuring theirselves to fill in the positions of our BIGBANG seniors, I think it's more that we need to work harder in not ruining the open path that they have paved the way. iKON working hard to show their best image. They feel that Blackpink's work is outstanding. Though iKON hardly get much chances to get acquainted often, iKON have high respect and find them very cool for their high-rising achievements. "I don't feel burdened about the results if it will be received with love or not." B.I continues, "I am already satisfied & content with the result because the process of working on the album was fun and there was no burden made with it."